More Information: Register online or print and mail the registration form. Learn about God’s plan for grandparents and be equipped to pass on a Heritage of Faith. Catch the vision for passing on the Catholic faith to future generations. Hear what God says about the role of grandparents. Gain ideas to strengthen your relationship with both adult children and grandchildren. Discover how to encourage faith in your own children – it’s never too late. Be equipped with resources to help you make disciples in the next generation. Receive encouragement by connecting with other grandparents. Learn practical ways to help your parish become more intergenerational. Register online or print and mail the registration form. Parishes: Please print and post a flyer (vertical; horizontal). Mary Ann Kuharski is a wife and mother of 13 children, six of whom are adopted and of mixed races with special needs. She and her husband John are members of St. Charles Borromeo Parish in Minneapolis, and are active members of the Knights of Columbus. They are now grandparents to a growing and extended family. Mary Ann is an author and national speaker on life and family issues. She is a founding member and Director of PROLIFE Across AMERICA, known as “The Billboard People” for its positive and persuasive educational messages, which have appeared in 46 states. In 2017, she was the recipient of Relevant Radio’s Christ Brings Hope Award. Molly Schorr is the Director of Parish Life and Evangelization at St. Vincent de Paul in Brooklyn Park, MN. She has been in ministry for over 15 years. She holds a BA in Theology from the College of St. Benedict and an MA in Pastoral Ministry/Theology from St. John’s University. Molly has a passion for sharing the Gospel and helping to equip people to share the joy of their own faith in Jesus Christ. She lives in Maple Grove with her husband and two beautiful children. 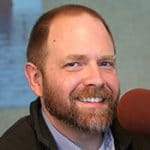 Patrick Conley works in the Office of Evangelization at the Archdiocese of Saint Paul and Minneapolis, hosting the weekly Rediscover: Hour on Relevant Radio and coordinating and presenting Called & Gifted™ spiritual gifts discernment workshops, developed by the Catherine of Siena Institute. Patrick holds a degree in Theology from Oxford University, has done doctoral-level theological work, and has worked a number of years in parish ministry. He and his wife, Kendra, are currently forging a new life in rural Wisconsin on Kendra’s family farm. Patrick enjoys riding his motorcycle, brewing ale, smoking his pipe, and spending time with Kendra and their bulldogs, Georgie and Bingley. Fr. Joseph Bambenek is a second career vocation, ordained to the priesthood in 2010. A native of Hastings, before entering the Pre-Theology program at Ave Maria College and attending St. Paul Seminary, Fr. Bambenek worked in the electric power industry for about a decade after earning a physics degree from Truman State University and a double Masters from the Massachusetts Institute of Technology. Fr. Bambenek served as an associate priest at Nativity in St. Paul, where he helped to found the Grandparents Apostolate of Sts. Joachim and Anne, and at St. Michael in St. Michael. 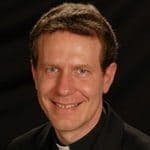 He then became pastor of St. Pius X in White Bear Lake and chaplain of Frassati Catholic Academy, and along the way, the chaplain for the Archdiocesan Grandparents Ministry. In 2017 Fr. Bambenek was granted a sabbatical to develop a “Healing the Whole Parish” retreat. Crystal Crocker has been the Director of the Office of Evangelization for the Archdiocese of Saint Paul and Minneapolis since 2016. Under her direction, the Office of Evangelization provides initiatives for men, women and grandparents and collaborates with national groups to bring best practices in evangelization. Crystal comes from a business background and previously worked as an Outreach Coordinator for Minnesota Catholic Conference and the Chair for the 2014 Rediscover: Catholic Celebration.